A tenuous truce ending days of street fighting in the Yemeni capital has broken down between tribal groups and forces loyal to President Ali Abdullah Saleh, bringing the country closer to civil war. "The ceasefire agreement has ended," a government official said on Tuesday. The weekend agreement took effect after more than 115 people were killed when the two sides battled with machine guns, mortars and rocket propelled grenades in the fighting in Sanaa. Global powers have been pressing Saleh to sign a Gulf-led deal to handover power aimed at stemming the growing chaos in Yemen, home to al Qaeda militants and neighbor to the world's biggest oil exporter, Saudi Arabia. Government troops and locals have been trying to force al Qaeda and Islamists militants from the southern city of Zinjibar after they seized the coastal town at the weekend. Saba news agency reported on Tuesday that 21 Yemeni soldiers were killed a day earlier in the clashes where Yemen's air force dropped bombs on the city of 20,000 near the Gulf of Aden. The United States and Saudi Arabia, both targets of attacks by Yemen-based al Qaeda in the Arabian Peninsula, are worried that chaos is emboldening the group. Opposition leaders have accused Saleh of deliberately allowing Zinjibar, near a sea lane where about 3 million barrels of oil pass daily, to fall to al Qaeda in a bid to show how chaotic Yemen would be without him. Opposition groups made up of tribal leaders, Islamists and leftists have said they could do a far better job of curtailing the al Qaeda threat. 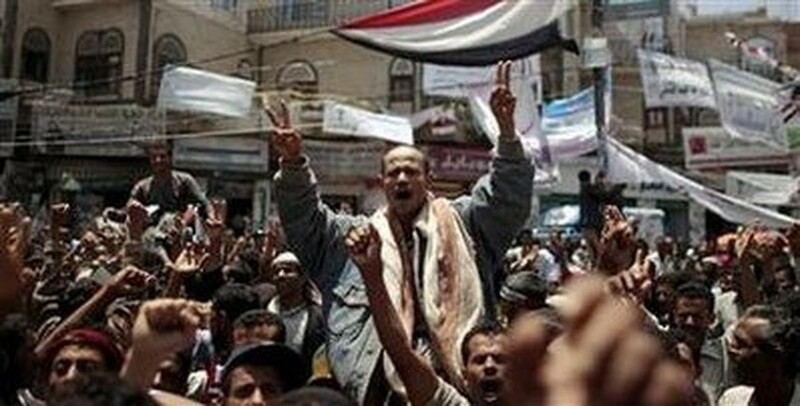 At least 320 people have been killed in various fighting in Yemen since protests calling for Saleh to end his nearly 33 year rule started about four months ago, inspired by the popular uprisings that ended the reign of the long-standing rulers of Tunisia and Egypt. Under Saleh, Yemen has moved to the brink of financial collapse, with about 40 percent of the population living on less than $2 a day and a third facing chronic hunger.